After class I changed into my cross front dress again, this time wearing it with the velvet sleeveless spencer and my favorite shawl. My outfit was super comfy and I was pleased with everything but my hair. Since this is a transitional style, I really need something a little bigger. 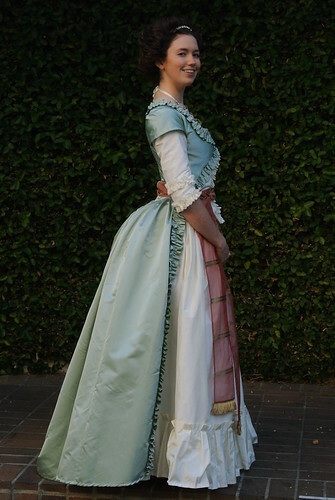 I feel like I can do passible 1780s hair now (especially with a wig), and next I plan to conquer 1790s styles. 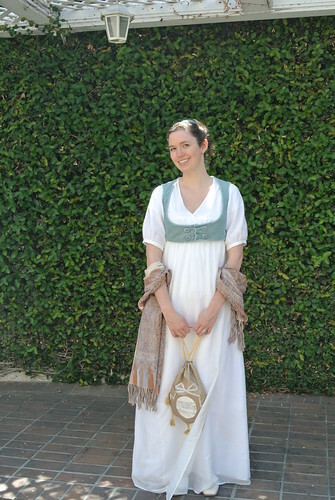 For the Gala I wore my 1780s satin gown, and accessorized it with a vintage paste comb and a modern bridal necklace from eBay. The necklace originally had an ugly chain that fastened it around the neck, so I had my husband pry it off and I replaced it with a silk ribbon. Much better! I had a great time at the Gala chatting with every one and then making a fool of myself on the dance floor. 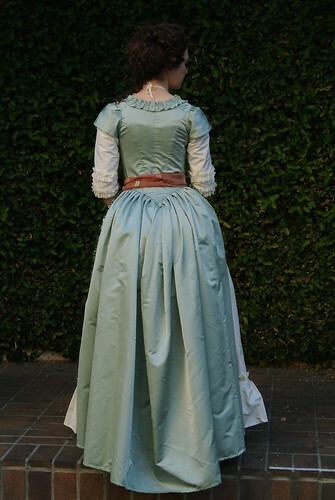 One thing I learned, or more accurately was reminded of, was that pretty as taffeta is, I get far too overheated in my silk stays. A new pair of linen stays is a must before I do 18th century again. Dancing is a priority!